Many scientists overuse the passive voice. They write as though it were somehow impolite or unscientific to name the agent of action in a sentence. They seem to feel that every sentence must be written in passive terms, and they undergo elaborate contortions to do so. However, in any type of writing, the active voice is more precise and less wordy than the passive voice. It is the natural voice in which most people speak and write. The active voice also adds energy to your writing, and forces you to decide what you want to say. The passive often obscures your true meaning and compounds your chances of producing pompous prose. Compare the alternatives in Table 6.3. To convert a sentence that is in the passive voice to one in the active voice, search for the true subject, and name it. Then find the verb, and mentally drop the form of to be. Convert what is left of the verb to the active voice. Passive: The genetic relationship was studied by Berger and Shanks (1981). Active: Berger and Shanks (1981) studied the genetic relationship. It is recommended by the authors of the present We recommend . . The animal was observed to be situated in dorsal recumbence which had the effect of rendering its legs useless. The data which were obtained by Johnson were probably indicative of. . . The following results were obtained . . . It was discovered that a sustained coordinated effort will be required . . . Lying on its back, the animal could not use its legs. Johnson's data probably indicate . . .
We obtained these results . . . We need a sustained coordinated effort. Rewrite these passive sentences in the active voice. Condense and clarify the wording if you can. 1. It might be expected that this treatment would be effective. 2. No feed was available to the pathologist to analyze. 3. Inoculation was performed on 25 chickens by Jones and colleagues. 4. A collecting trip was made by this writer to Georgia for the purpose of collecting Lepidoptera. 5. Passages A and B should be marked for revision. 6. If certain words are discovered to be missing from this medical dictionary, it must be remembered that no equivalents for modern technical words were to be had by ancient speakers of Greek and Latin. 7. Three incineration systems are being studied for the university president by administrative personnel at the Biology Building. A more vigorous active verb also may be hidden in a noun ending in -ion. You can often exhume these buried verbs to convert the sentence into the active voice. Buried verb hidden in "-ion" noun: Antibody detection was accomplished by Team A. Resurrected verb: Team A detected antibodies. Correct the following sentences if needed. Explain your reasoning. The remaining fluid was drawn off and the kidneys washed. Due to the small number of test animals used, that data was not significant. Karyorrhexis, karyolysis, and cellular degeneration of hepatocytes was evident within the centrilobular regions. The data indicates that Jones together with his wife and children was the first to discover the phenomenon. None of the animals was harmed in the course of this study. A sample was assessed by radiocarbon dating and sections analyzed by potassium-argon methods. Neither the rats nor the chimpanzee were kept in the laboratory. Because of the writing style that they have adopted, scientists find it surprisingly difficult to use correct verb forms. The two most common grammatical errors in scientific writing are errors in verb use: subject-verb disagreement and dangling participles. The effect of feeding rations containing concentrations of aflatoxin on the immune systems of young swine with lesions and enzymes were studied. Were the effect and the enzymes studied? Or did the swine have both lesions and enzymes? Is effect the subject, in which case the were is incorrect? Because of lack of subject-verb agreement, the reader cannot be sure. The writers knew that the subjects and verbs must agree in number, but they allowed the two to become separated so widely that they lost track of them. To check a sentence, temporarily omit all phrases that separate the subject and verb, including those that begin with such words as together with, including, plus, and as well as. This will give a sentence in which subject and verb are readily apparent. Both should be singular, or both should be plural. 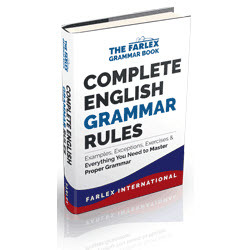 Correct the grammar, and move the subject and verb closer to one another to improve the sentence. For good measure, whenever possible also tighten the wording and recast the sentence in the active voice. Incorrect grammar with separated subject and verb: A high concentration of sialic acids which are a group of substances principally composed of amino sugars attached to polysaccharides, lipids, or proteins are found in the mammalian epididymis. Omit intervening phrases: A high concentration . . . are found in the mammalian epididymis. Improved, grammatically correct sentence: The mammalian epididymis contains a high concentration of sialic acids, principally composed of amino sugars attached to polysaccharides, lipids, or proteins. Flitting from flower to flower, the entomologist observed the bees. Sometimes, you may find that your words and phrases become linked together in strange and unanticipated ways. Confusion, ambiguity, or downright humor can result. Usually, the problem lies in unclear antecedents or poorly placed modifiers. An antecedent is a word or phrase that a subsequent word refers back to. Modifiers are words, phrases, or clauses that expand, limit, or make more precise the meaning of other elements in a sentence. Because both antecedents and modifiers must be linked to another word or phrase in the sentence, they cause problems when they appear in the wrong location. A word or passage is ambiguous when it can be interpreted in two or more ways. Common causes of ambiguity include ambiguous pronoun references, misplaced modifiers, and incomplete comparisons (see the last section in this chapter). Pronouns often cause ambiguity because - since they serve as stand-ins for another word or group of words - pronouns always have antecedents. Ambiguous pronoun reference often takes the form of two-sentence clusters, in which the first sentence has two possible antecedents for the pronoun in the second sentence. Specific: Inadequate training in PCR techniques resulted in incomplete data. Training inadequacies have been our most pervasive problem. Check such words as all, it, its, this, that, their, and other pronouns. Clarify their antecedents.